Lillian Reese is her name. We don’t know what we are calling her yet (Lily, Reese, or Lily Reese). I’m all about a double name and Brent is completely against a double name, so we’ll see what happens! She is named after my deceased grandfather’s mom, Lillian. I never knew her, but she raised a wonderful man and he was a wonderful grandfather to me. 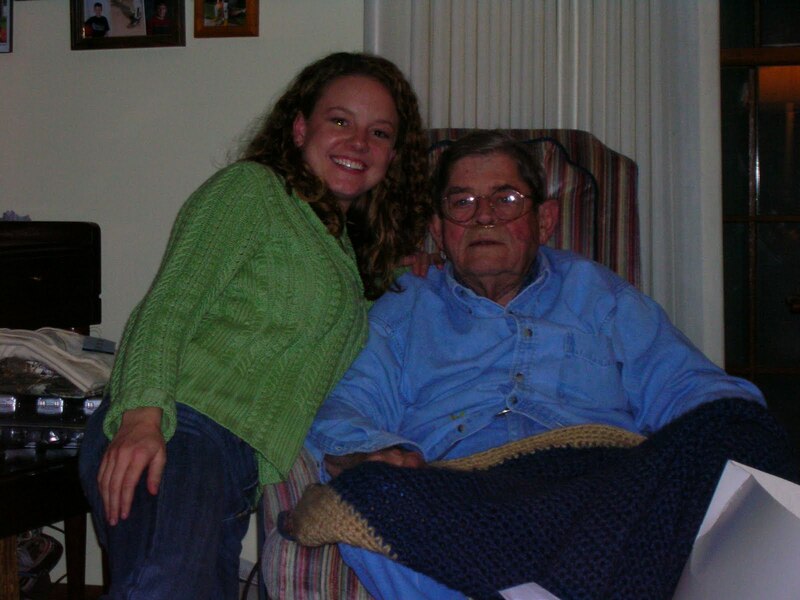 The picture above is of Pop Pop and me Christmas 2007, right after Brent and I got engaged. He passed away in April of that year. Please ignore the bad picture quality and the shiny glare in my eyes. I’ve liked the name Reese for at least a year and knew I wanted my first daughter to be named Reese. But, since it’s one syllable it needs to be a middle name (in most situations). I also wanted to use a family name. Lillian is what we liked the most, and really the only name that worked with Reese from both sides of our family. As it turns out, my mother-in-law, Teresa, is frequently called Reese by her dad and brother, so I guess we are using two family names. Brent didn’t like the name Lillian when I first mentioned it to him (we were going with Madelyn Reese at the time) but now that it’s official that we are having a girl, he LOVES the name and he is already wrapped around her tiny little fingers. She was 13 oz. on Monday and her heart rate was 148. She is about the size of a banana (in length). Sorry we haven’t been keeping up with our family food portraits…it’s just like housework, once I get behind a little bit, I’m completely unmotivated to catch up and I get even further behind. I’m not a quitter though…yet. Maybe we’ll find time this weekend to catch up…maybe. Congratulations again! Lillian Reese is the perfect name for a beautiful addition to your family. P.S. I love the reasoning behind choosing Lillian as her name!